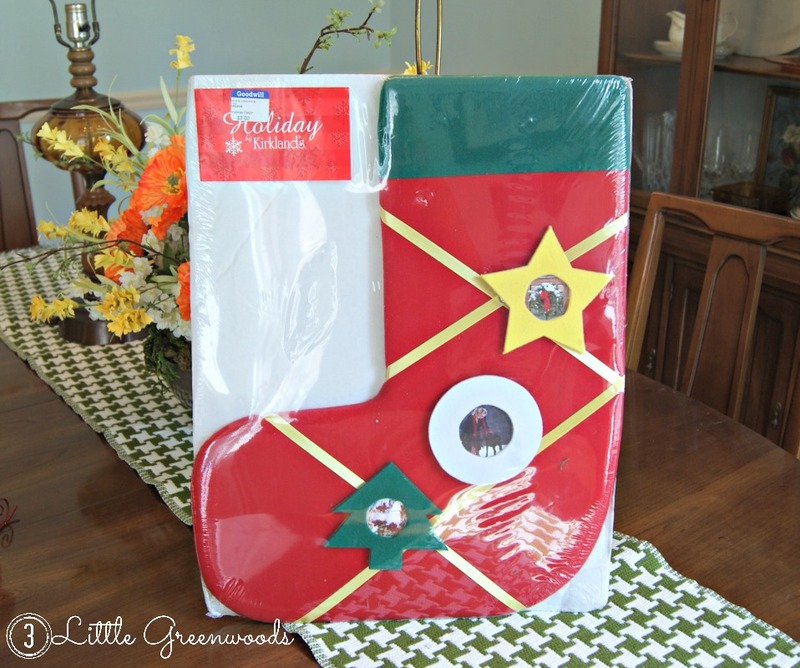 Christmas in July ~ Thank you Goodwill Fairies! Now don’t go rolling your eyes at my Christmas excitement. I am fully aware that The Most Stressful Wonderful Time of the Year is over five months away. But when the Goodwill fairies place treasures in your path you grab them up. Especially if it’s Yellow Sticker Half Off Day! Ever since I created my Star Spangled Door Decor, I have been scheming about what other shapes would look good painted up for the front door. 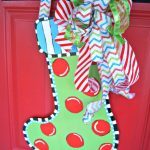 When I saw this stocking shaped memo board I immediately transformed it into fabulously painted door decor with a big sassy bow. All in my mind, of course. Another little sleigh to add to my collection of one. Two of anything makes a collection, right? 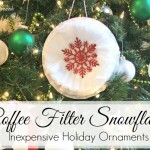 Fill these up with pretty wrapped presents to make a dining room table centerpiece? Or maybe on the mantel or foyer tables? 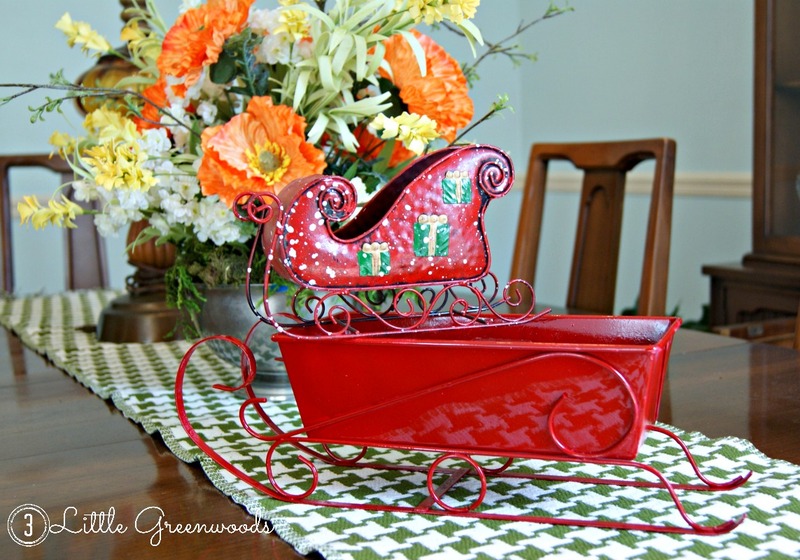 Who knows where these sleighs will end up? I definitely need more of these! This little Christmas tree fits perfectly in my fabulous Kitchen Hutch. It took months of Craigslist and yard sale stalking to find just the right piece to fit my space and I can’t wait to pretty it up during the holidays. All the little tree needs is a sparkling strand of lights, colorful ornaments, and it’s good to go! Well… that might not be all it needs. 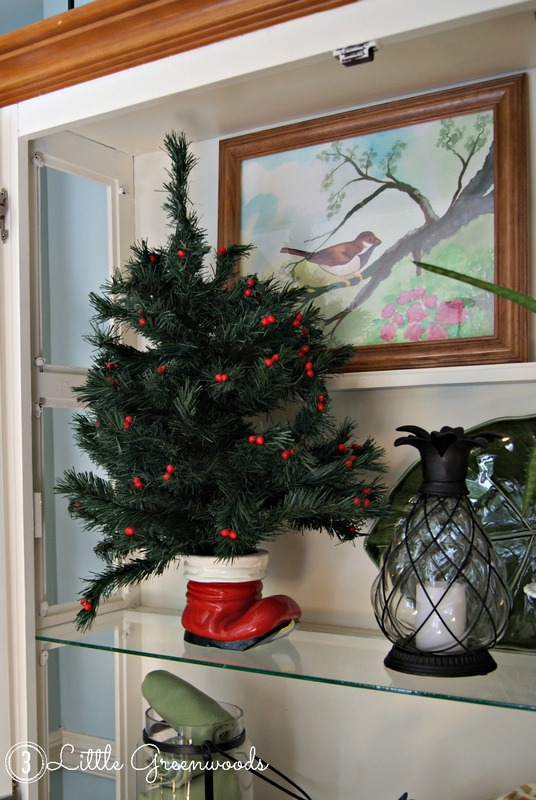 I’d decide later if Santa’s bright red boot and all the red holly berries stay or not. See there? I bet my little Goodwill finds have gotten you in the mood for a little Christmas decorating too. 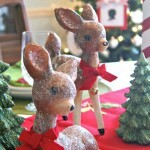 If you’d like to see what else I am working up for the holidays, hop over to my Pinterest Boards. I’d love for you to follow along! 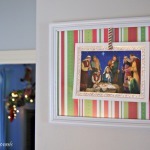 Follow Ashley’s board Christmas -decor on Pinterest. 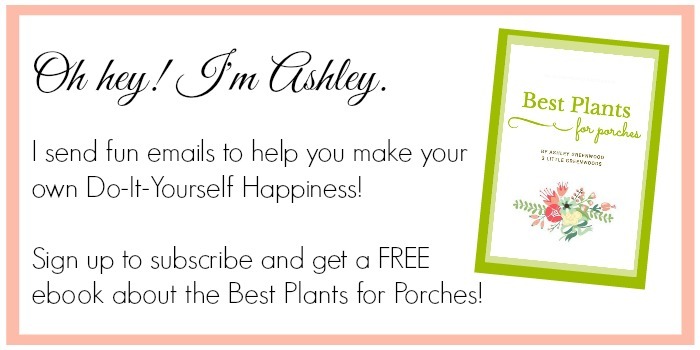 Follow Ashley’s board Christmas – gifts to give on Pinterest. 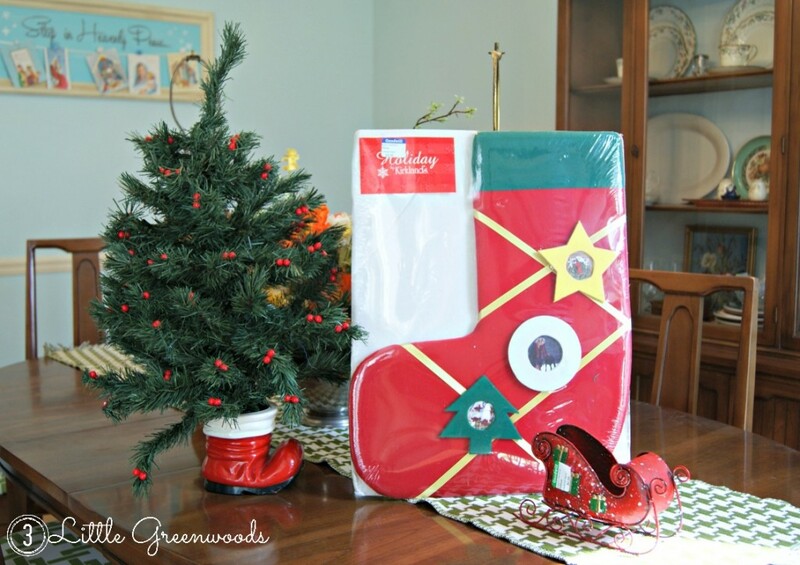 great finds…our Goodwill doesn’t have a Christmas in July sale – that little tree is really cute!! I can’t wait for Christmas! It’s my favorite time of year, it’s cold outside, warm inside, & it smells amazing. I like your goodies! I love your finds! Yes two of something equals a collection! 😀 Great prices too! You found some cute stuff. I love Goodwill… can’t beat their prices! Goodwill is always such a treasure hunt, isn’t it? I’m already wishing I had picked up a few more things. Oh, what wonderful finds. 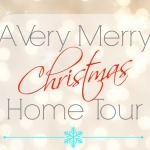 I am not quite ready to think about Christmas….but these bargains were too good to pass up. I think the little Santa boot base on the tree might be sort of an antique….is it ceramic? If so you might have an even greater treasure than you thought! 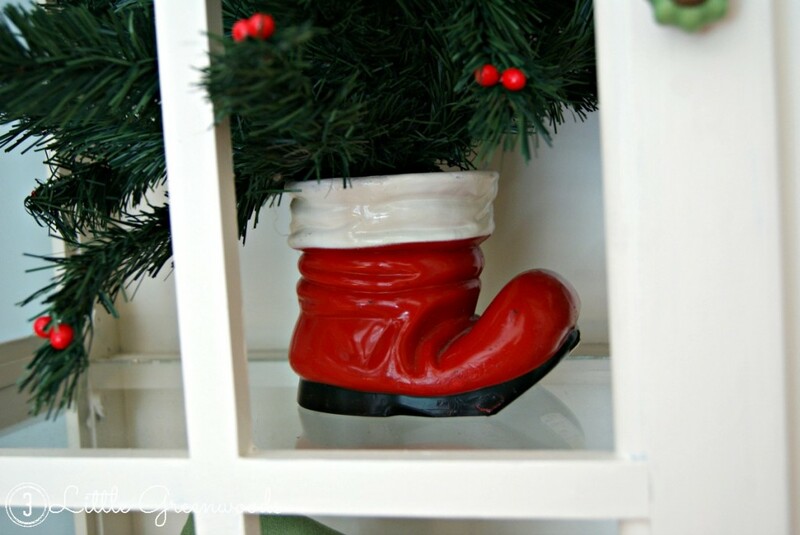 The Santa boot is ceramic but I don’t think it’s very old. Still love that little tree and can’t wait to decorate it for Christmas season. Thanks for the comment love! Oh, very cute finds 🙂 I’d love for you to come link up with me, too! Together on Tuesdays! 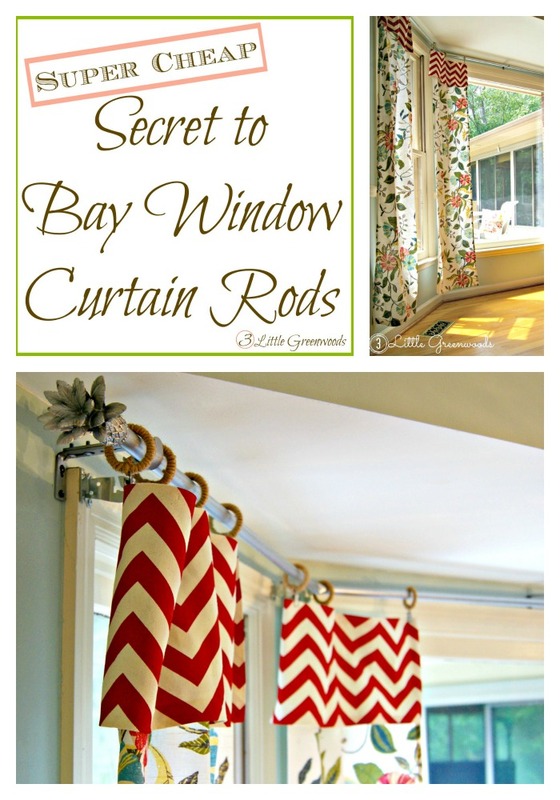 Thanks for the blog love and the invite to link up! 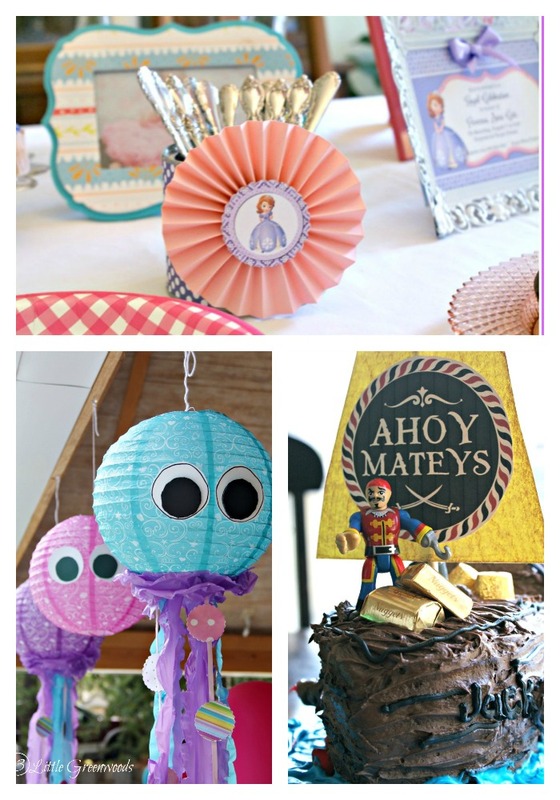 Thanks for linking up at the Bewitchin Projects party this week! 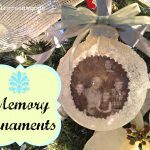 I can’t wait to see what you link up again next week over at OurMiniFamily.com! Wishing you lots of time off with family for the holidays this year!